The Seedbagger (ハナビムシ?, lit. : "Fireworks Bug") is an enemy found in Hey! Pikmin. It is a large gelatinous creature that stores many Sparklium Seeds inside its body. When attacked, it will try to retreat by burying itself into the ground. It is found only in the area Echo Cavern. Because of this creature's rarity, and how it doesn't even drop a treasure, it can easily be missed. To do: Fill in the stats table. The Seedbagger is a large, passive creature that stores Sparklium inside its translucent body. It moves fairly slow, and doesn't have any methods of attacking. Seedbaggers are large and have quite a bit of health. 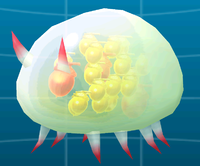 Despite this, they are completely passive and lack any means of defending themselves or attacking Pikmin. Simply lobbing Pikmin at them repeatedly will defeat them, causing them to drop all of their loot. An image of the creature burrowing, and an image of it defeated. The Seedbagger is based off the real-world Sea Pig. Its color scheme and appearance make it similar to a Metroid. This page was last edited on March 1, 2019, at 21:30.